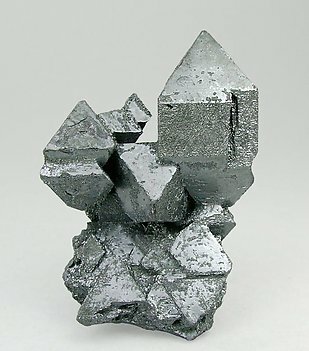 Parallel and skeletal growths of octahedral crystals, pseudomorphs after Magnetite, and almost completely covered by a second generation of laminar and bright crystals of Hematite. 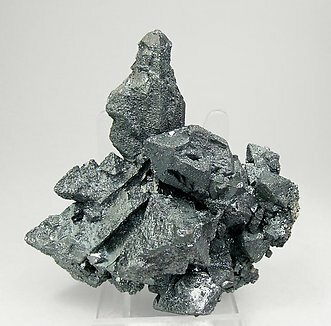 Aggregate of Hematite crystals pseudomorphous after Magnetite, with a very sharp octahedral shape, very well defined parallel growths and some of them with skeletal forms. 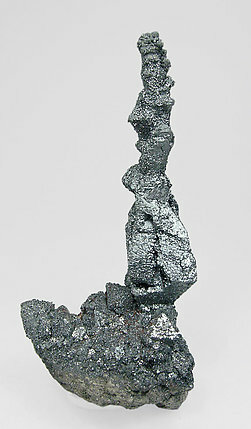 Sharp doubly terminated crystal pseudomorphous after Magnetite. 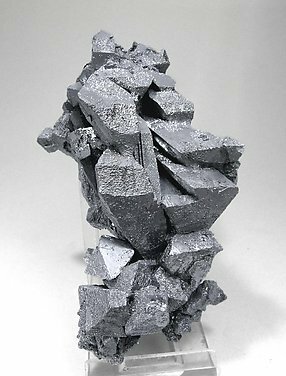 It is elongated, with very well defined skeletal forms and partially coated by small recrystallized lenticular Hematite crystals. 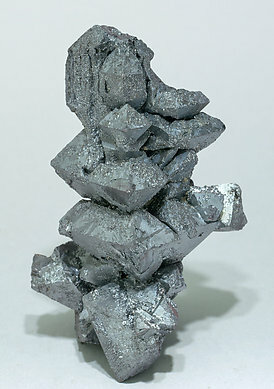 Aggregate of Hematite crystals pseudomorphous after Magnetite, with a very sharp octahedral shape, some of them very elongated and almost completely coated by small lenticular recrystallized Hematite. A novelty this year in Munich, because it is from a very recent find. 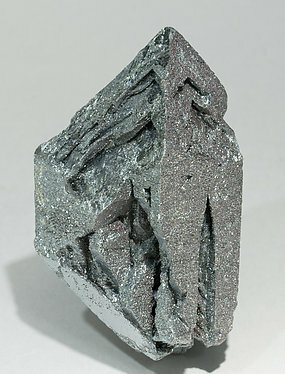 Parallel growths of octahedral crystals, pseudomorphs after Magnetite, very well defined, bright and partially covered by a second generation of small laminar crystals of Hematite. Parallel growths of octahedral crystals, pseudomorphs of Magnetite, some of them unusually elongated and others with very well marked skeletal growths. On the faces of the Hematite a second generation of very bright thin small laminar crystals of the same mineral has formed. Parallel growths of octahedral crystals, pseudomorphs of Magnetite with very well defined faces and edges. 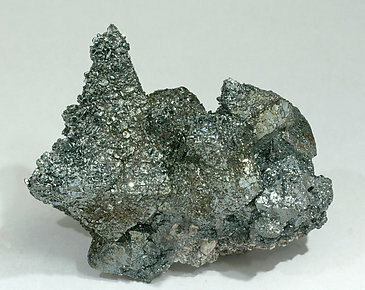 On the faces of the Hematite a second generation of very bright thin small laminar crystals of the same mineral has formed. 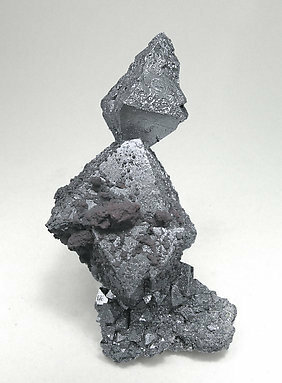 Aggregate of Hematite crystals pseudomorphous after Magnetite, with a very sharp octahedral shape and some of them very elongated and almost completely coated by small lenticular recrystallized Hematite. A novelty this year in Munich, because it is from a very recent find. 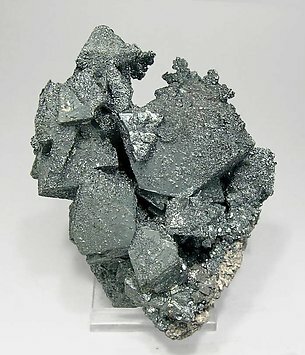 Parallel and skeletal growths of octahedral crystals extraordinarily elongated, pseudomorphs after Magnetite, very well defined, bright and almost completely covered by a second generation of small laminar crystals of Hematite. This specimen was photographed for the ‘what’s new at Munich 2008’ section of the magazine ‘Mineralien Welt’ and appears on page 16 of number 1/2009. A novelty this year in Munich, because it is from a very recent find. 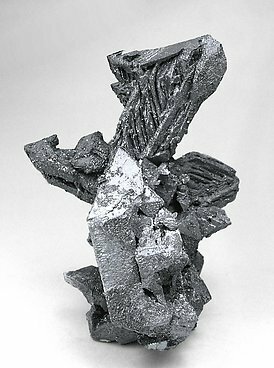 Parallel and skeletal growths of octahedral crystals, some of them extraordinarily elongated, pseudomorphs after Magnetite, very well defined, bright and almost completely covered by a second generation of small laminar crystals of Hematite. Extraordinarily acute parallel growth of octahedral crystals, pseudomorphs of Magnetite, with very well defined faces and edges and with very well marked skeletal growths. 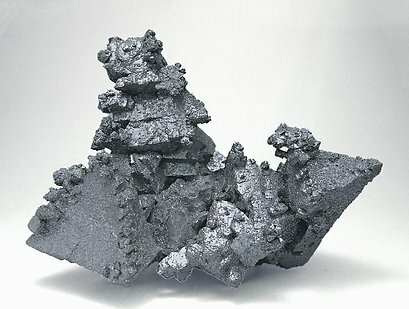 On the faces of the Hematite a second generation of very bright thin small laminar crystals of the same mineral has formed. On the specimen coexist two generations of crystals of Hematite. 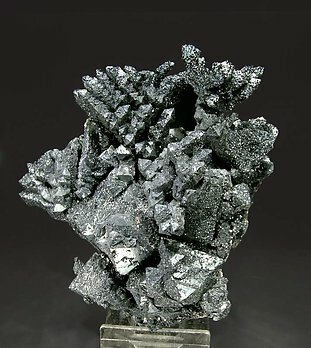 The first one has arborescent growths of octahedral crystals that are pseudomorphs after Magnetite (the variety Martite). 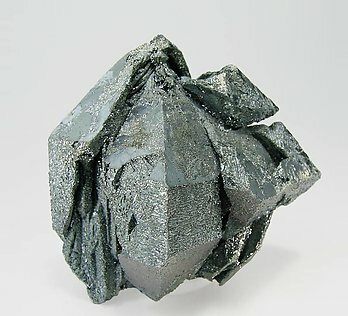 On those octahedrons is formed a second generation of very bright laminar crystals of Hematite. 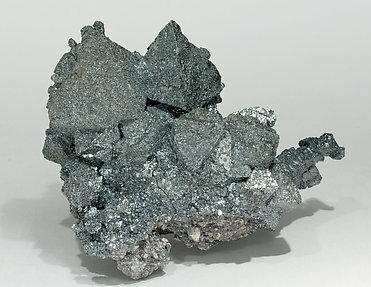 Aside from its mineralogical interest, the specimen is notably esthetic. A very good sample. The specimen has been reviewed, photographed and published as a new discovery in the magazine ‘Rivista Mineralogica Italiana’ on page 286 in number 2007/4.